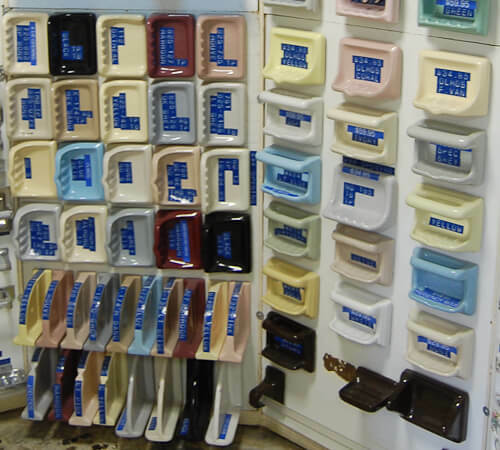 This weekend, I received confirmation from a reader who’s been to the liquidation sale, twice: Yes, World of Tile — our beloved time capsule tile store — chock full of New Old Stock going back to the 1960s — seems to be in the midst of closing. 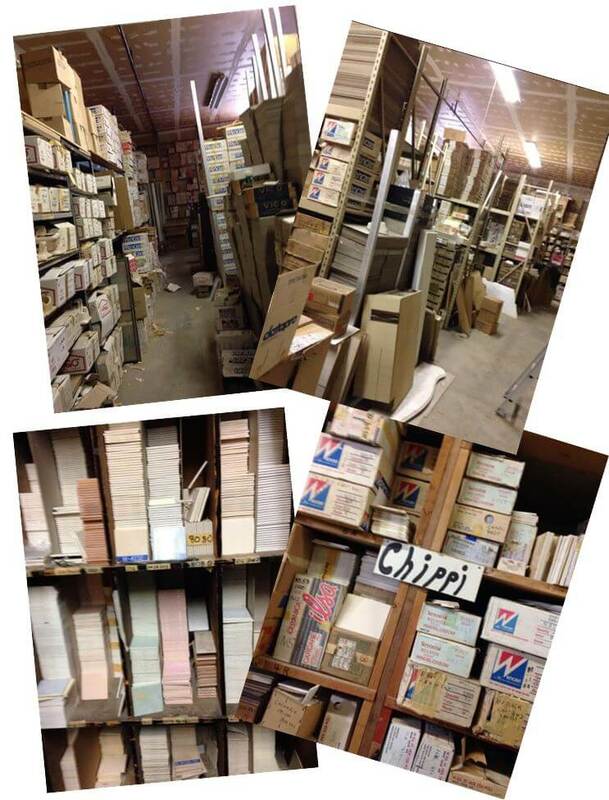 Currently, there is a big closeout of all stock going on — 80% off, Marie says, and you can wander throughout the cavernous structure to hunt treasure in every nook and cranny. I do love me a time capsule liquidation sale — and this may be one unlike any other — but even so, please say it ain’t so. Alas. 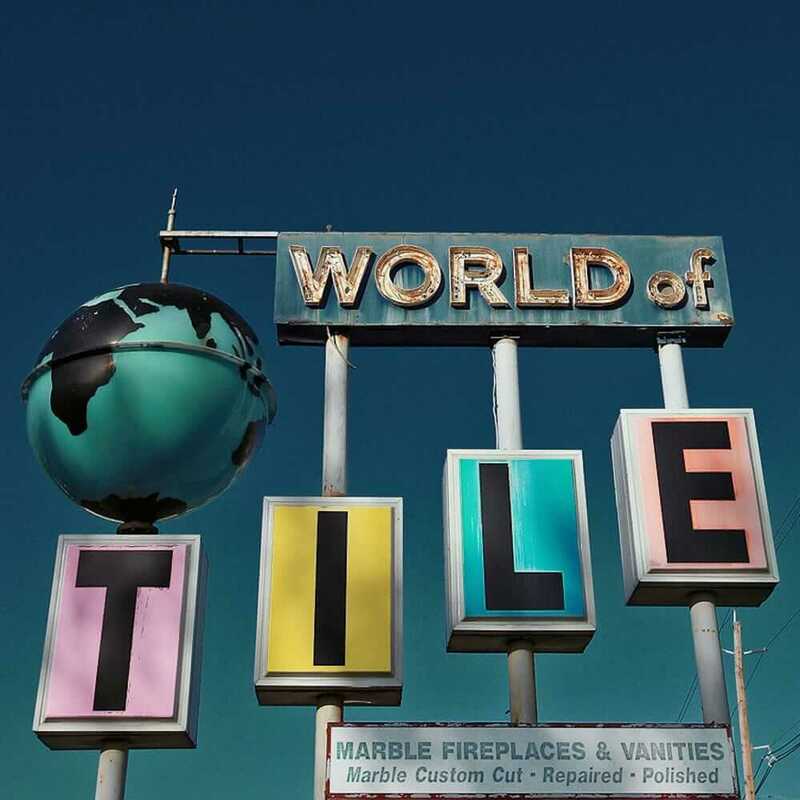 Lovely photo of World of Tile’s classic 1960s sign (click to enlarge and experience the beauty) courtesy Tony Zarak on flickr and professionally here. 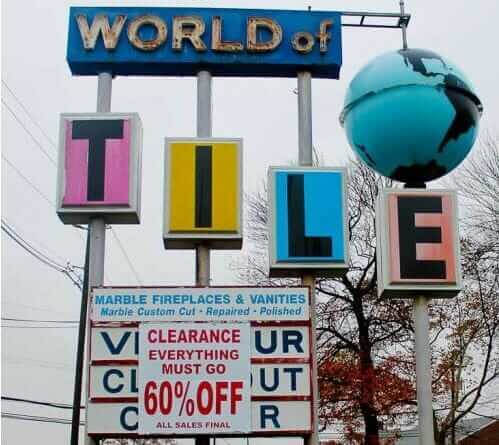 Thanks to you, I discovered World of Tile in Springfield, New Jersey. Sadly today, I discovered it was sold and in liquidation. Marie took these photos at the liquidation sale on Sunday — she went back a second time over the weekend. Right now every room is open to the public to roam and select things and pay for it in cash. So, those wonderful black ceramic bathroom fixtures she used to sell for $30 are going for $5. 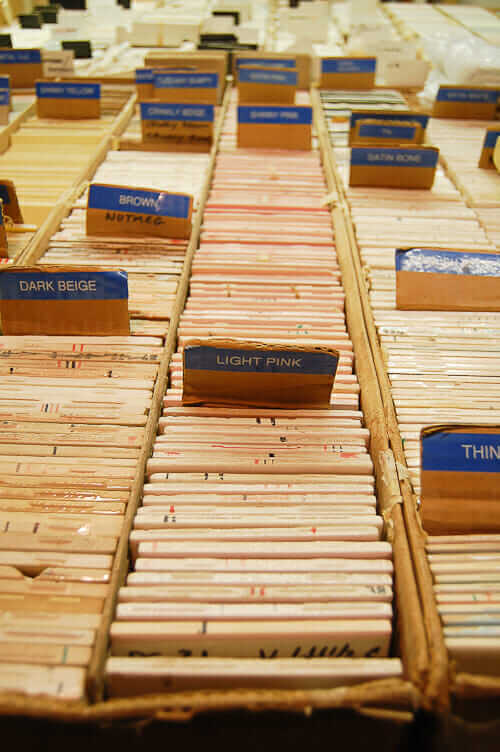 Boxes of 50 tiles – $8/box. 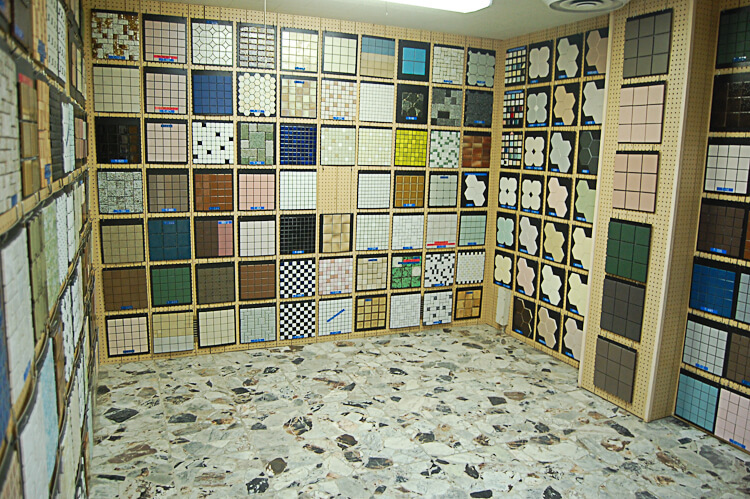 There is room upon room of tile and you just make a deal for it. Very good deals indeed, I’m sorry to say. But for your readers, if they go (with a mask and a flashlight-it’s dusty), the gigantic caverns are theres to explore and find treasures! You can go upstairs, downstairs, basement and the rooms in the warehouse. Crazy! In the cavernous basement. 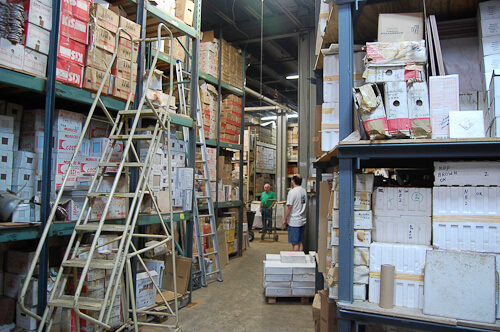 It’s like that federal warehouse at the end of Raiders of the Lost Ark…. Update: I spoke with Marie this morning — she added that on-site liquidators told her that the sale is expected to continue for about two weeks. I had received hints of this news from a few other readers, but could not confirm what was going on. As of early last week, at least, the phone number was disconnected. My emails were not returned. I then began trying to reach a friend nearby to see if she could drive over to see if I could get some sort of official information on the situation. While I was trying to find out something definitive, I didn’t want to jump the gun with a speculative story. But now, we have Marie’s on-site report. So here’s the story, as much as I know. Chippy, when the New York Times visited with me. Nicky and Jason (Jason in this photo) were the ones to discover World of Tile and report their find to Retro Renovation, so’s we could share it with retroworld. Everlasting gobstopper thanks to you, Nicky and Jason! This is really sad. 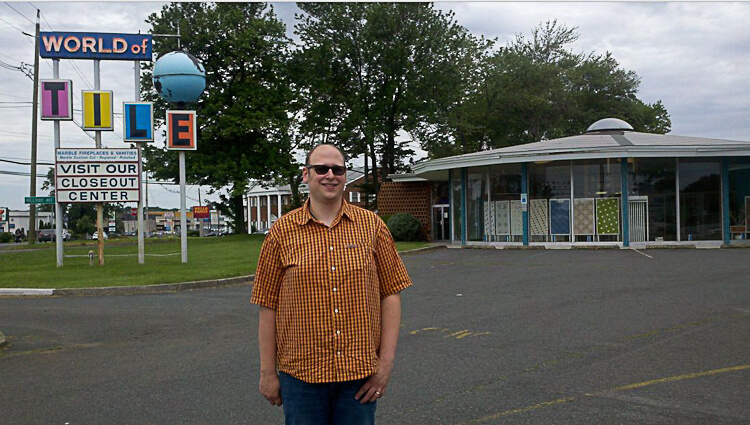 I loved that place. … and it was Our World of Tile. Yikes, I have things going on today and tomorrow. But if I can confirm that doors are open on Wednesday… and if I can steel myself for the three-hour drive (each way, ugh), I might drive down to World of Tile with a camera and video camera and a big wad of cash for one last visit … and one final report. 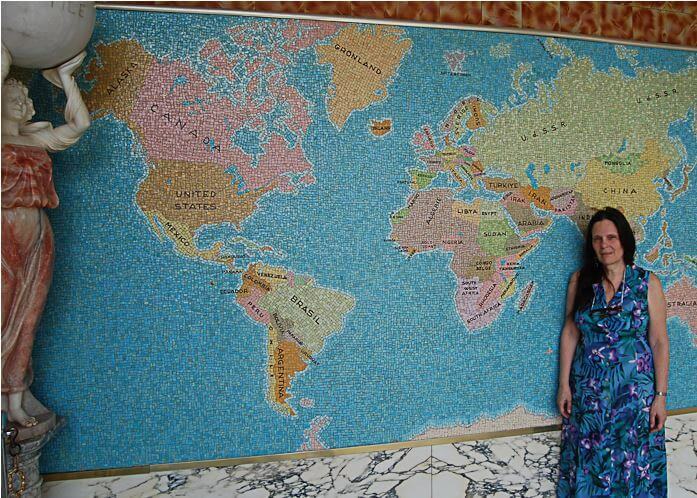 You can read our complete archive of World of Tile stories — including scores of photos — here. I wonder if NY Times might be interested in knowing about the closing. Maybe they could write a story on it so others can get the last of the stock. I let my contact there know! Very sorry to hear of this. Too bad Chippy didn’t reach out for support by the Retro Renovation community before it came to this – maybe something could have been done. I hope it’s not due to family illness or something, which often causes small businesses to have to close down. But alas, the love of vintage tiles and accessories for bathrooms, kitchens and floor is not as widespread as we would wish. And a business must sell to stay open. Let’s hope a savvy jobber who understands the value of these items, at least picks them up (if only for cents on the dollar) with a plan to re-market them on e-bay, etsy, or even at a swap meet – anything other than a landfill, which would be a terrible waste and sacrilege! It’s distressing to hear that Pam’s emails and calls went unanswered; I hope Pam can find more verifiable details and reports back to us. It has finally happened, the world of banal, vanilla boring granite, tumbled marble tile has taken over. And just like that….it’s over. Oh, how sad. 🙁 I do hope the family are all right!